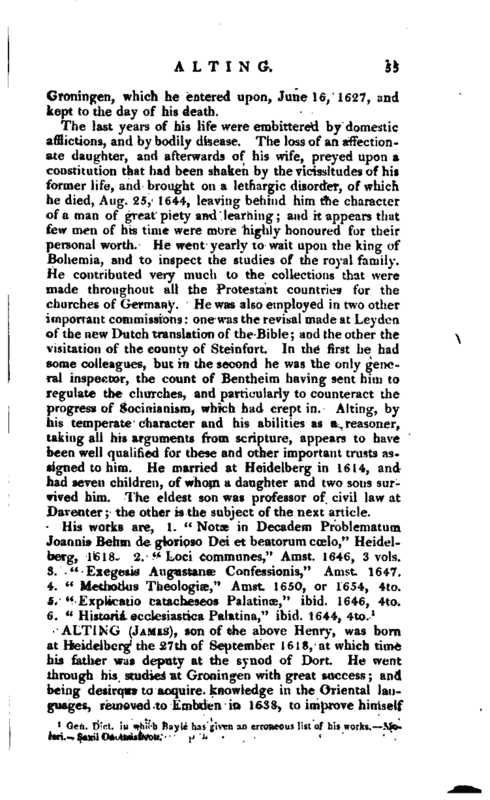 , an eminent German divine, was born at Embden, Feb. 17, 1583, of a family of considerable note in Friesland. His father, Menso Alting, was one of the first who preached the doctrines of the reformation in the territory of Groningen, about the year 1566, and under the tyrannical government of the duke of Alva. He faithfully served the church of Embden during the space of thirty-eight years, and died Oct. 7th, 1612. His sjn was from a child designed for the ministry, and sent very early to school, and afterwards into Germany in 1602. At Herborn he made such uncommon progress under the celebrated Piscator, Matthias, Martinius, &c. that he was allowed to teach philosophy and divinity. While preparing for his travels into Switzerland and France, he was chosen preceptor to three young counts, who studied at Sedan with the electoral prince Palatine, and took possession of that employment about September 1605; but the storm which the duke of Bomllon was threatened with by Henry IV. obliging the electoral prince to retire from Sedan with the three young noblemen, Alting accompanied them to Heidelberg. Here he continued to instruct his noble pupils, and was admitted to read lectures in geography and history to the electoral prince till 1608, when he was declared his preceptor. In this character he accompanied him to Sedan, and was afterwards one of those who were appointed to attend the young elector on his journey into England in 1612, where he became acquainted with Dr. Abbot, archbishop of Canterbury, Dr. King, bishop of London, Dr. Hackwell, preceptor to the prince of Wales; and also had the honour of an audience of king James. The marriage between the elector and the princess of England being solemnized at London in Feb. 1613, Alting left | England, and arrived at Heidelberg. In the ensuing August he was appointed professor of the common places of divinity, and to qualify himself for presiding in theological contests, he took the degree of D. D. In 1616 he had a troublesome office conferred upyn him, that of director of the collegium supientite of Heidelberg. In 1618 he was offered the second professorship of divinity, vacant by the death of Coppeniiis, which he refused, but procured it for Scultetus. He distinguished himself by his learning at the synod of Dort, whither he. was sent with two other deputies of the Palatinate, Scultetus and Tossanus. He appears to have conceived great hopes soon after his return to Heidelberg, the elector Palatine having gained a crown by the troubles of Bohemia, but he met with a dreadful disappointment. Count Tilli took Heidelberg by storm in Sept. 1622, and allowed his soldiers to commit every species of outrage and violence. Alting escaped almost by a miracle, which is thus related: He was in his study, when news was brought that the enemy was master of the town, and ready to plunder it. Upon his bolting his door he had recourse to prayer. One of his friends, accompanied by two soldiers, advised him to retire by the back door into the chancellor’s house, which was protected by a strong guard, because count Tilli designed the papers that were lodged there should come entire into his hands. 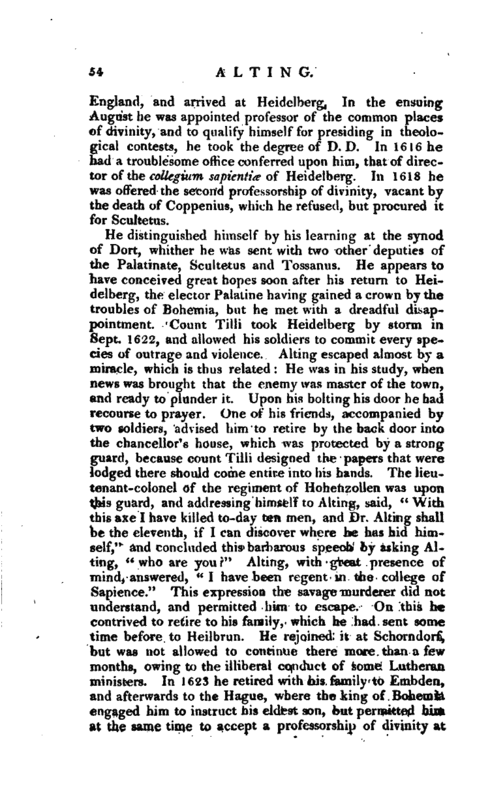 The lieutenant-colonel of the regiment of Hohenzollen was upon this guard, and addressing himself to Alting, said, “With this axe I have killed to-day ten men, and Dr. Alting shall be the eleventh, if I can discover where he has hid himself,” and concluded this barbarous speech by asking Alting, “who are you?” Alting, with great presence of mind, answered, “I have been regent in the college of Sapience.” This expression the savage murderer did not understand, and permitted him to escape. On this he contrived to retire to his family, which he had sent some time before to Heilbrun. He rejoined it at Schorndorf, but was not allowed to continue there more than a few months, owing to the illiberal conduct of some Lutheran ministers. In 1623 he retired with his family to Embden, and afterwards to the Hague, where the king of Bohemia engaged him to instruct his eldest son, but permitted him at the same time to accept a professorship of divinity at | Groningen, which he entered upon, June 16, 1627, and kept to the day of his death. The last years of his life were embittered by domestic afflictions, and by bodily disease. The loss of an affectionate daughter, and afterwards of his wife, preyed upon a constitution that haa been shaken by the vicissitudes of his former life., and brought on a lethargic disorder, of which be died, Aug. 25, 1644, leaving behind him the character of a man of great piety and learning; and it appears that few men of his time were more highly honoured for their personal worth. 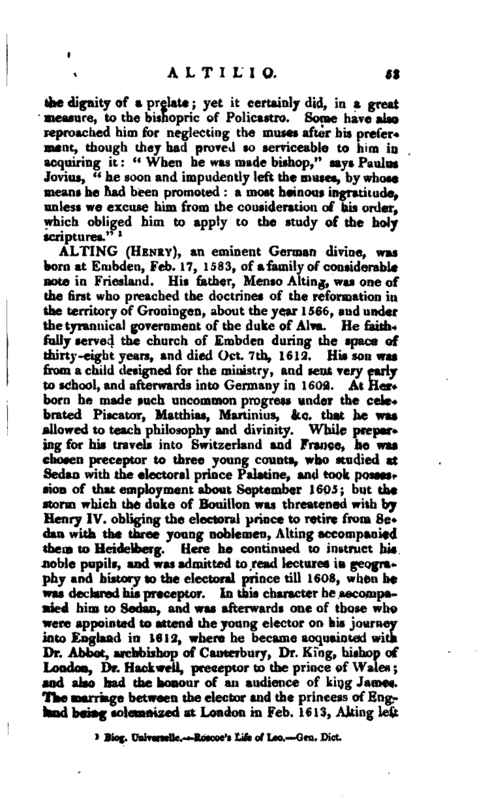 He went yearly to wait upou the king of Bohemia, and to inspect the studies of the royal family. He contributed very much to the collections that were made throughout all the Protestant countries for the churches of Germany. He was also employed in two other important commissions: one was the revisal made at Leyden of the new Dutch translation of the Bible; and the other the visitation of the county of Steinfurt. In the first he had some colleagues, but in the second he was the only general inspector, the count of Bentheim having sent him to regulate the churches, and particularly to counteract the progress of Socinianism, which had crept in. Alting, by his temperate character and his abilities as a reasoner, taking all his arguments from scripture, appears to have been well qualified for these and other important trusts assigned to him. He married at Heidelberg in 1614, and had seven children, of whom a daughter and two sons survived him. The eldest son was professor of civil law at Daventer; the other is the subject of the next article. 1 Gen. Dict. in which —Bayle has given an erroneous list of his works.-*-Mreri. Saxii Ououiasticon.